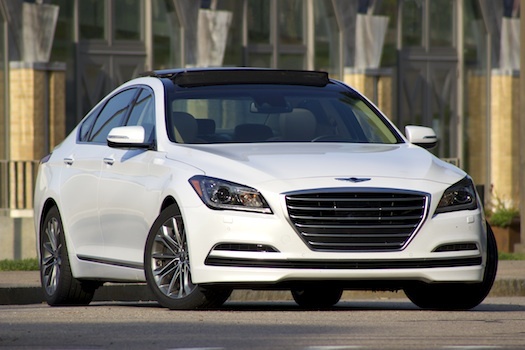 All-new for 2015, the Hyundai Genesis is a serious contender, fighting out of its weight class against luxury mainstays like the Lexus LS and the Infiniti Q50. At the base level, it undercuts those cars by tens of thousands, but in really short order, you end up with a price that will make everyone you mention it to gasp in disbelief. 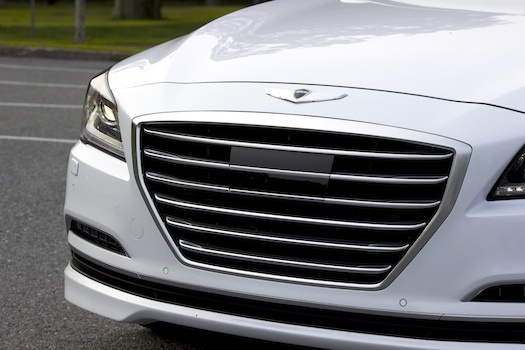 2015 marks the debut of the second-generation Genesis. 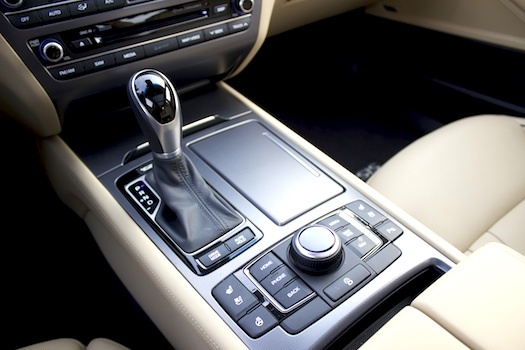 The first car, introduced in 2008, supposedly benchmarked the BMW 5-Series, but it felt much more like a faded Xerox copy of a 2003 Mercedes-Benz E-Class in actual practice. It’s not that it wasn’t a nice car, but it really had the more obvious trappings of a luxury car without every actually being luxurious. The second-generation Genesis is a whole different story. 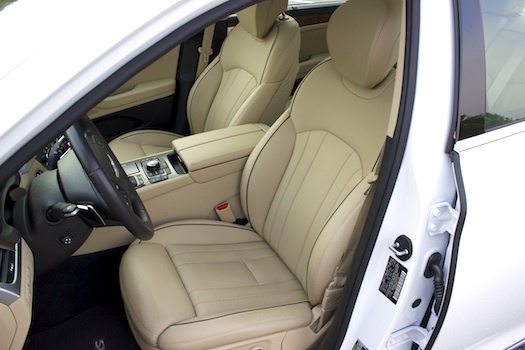 It is a luxury car, and there’s no mistaking it when you open the driver’s door. There are three basic editions: the 3.8, the 3.8 all-wheel drive, and the 5.0. 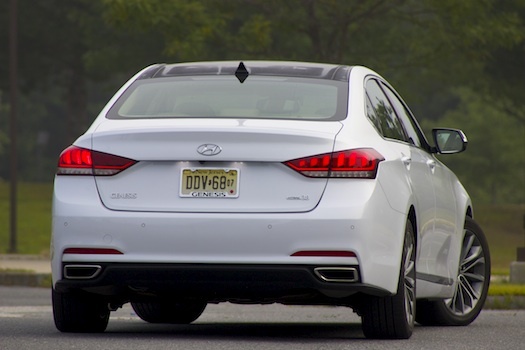 The middle version is what we had a chance to drive for some time, and it’s the car that (A) Hyundai hopes to sell in volume and (B) the car that finally makes the Genesis competitive against the cars Hyundai always hoped it would compete with. Its natural competitors are cars like the Lexus GS and the Infiniti M series of cars, but it’s really got the goods to step up and compete against cars like the Lexus LS and the Infiniti Q50, at least in their less-than-loaded forms. Hyundai will go on and on about “Fluidic Sculpture 2.0 Design Philosophy” blah blah blah, but the people who sketched and executed this thing did it right. It’s got a really long, 118.5-inch wheelbase, versus the the last car’s 115-inch wheelbase. Short overhangs make it seem stretched in the middle, almost as if it was a long-wheelbase version of a Lexus LS. The overhangs are accentuated with an upright grille and trunk lid, so the profile is really striking. I don’t typically write much about aesthetics, letting the pictures do the talking, but the 2015 Hyundai Genesis looks like a real luxury car from every angle. We drove a 3.8 all-wheel drive with a light tan interior, which gave the passenger cabin a wide-open feel, especially when combined with the massive glass panels overhead. 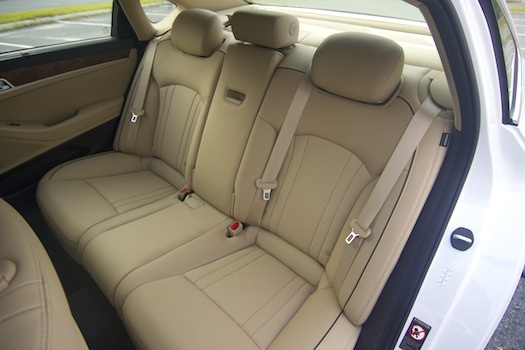 Everything you’d expect out of a luxury automobile is exactly in place: Comfortable, supportive seats that infinitely adjust, a giant center console with plenty of storage, privacy screens for rear passengers, tons of passenger volume and soft-touch materials just about everywhere. 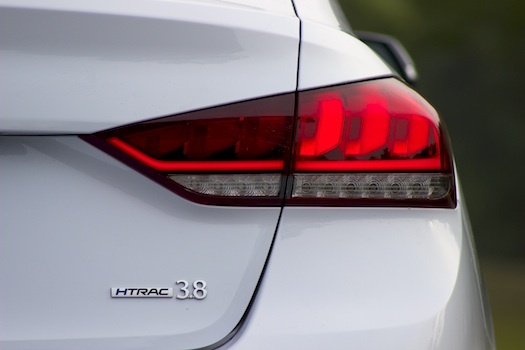 The 2014 Hyundai Genesis 3.8 AWD features — as evidenced by the chrome alphanumeric callout on the deck lid — a 3.8-liter V-6 with 311 horsepower at 6,000 rpm and 293 lb.-ft. of torque at 5,000 rpm. There’s the 5.0-liter V-8 trim, too, but until that arrives with all-wheel drive, it’s not what consumers are going to be looking for. Truthfully, you don’t need the V-8. I got a chance to sample the V-8 on a short ride-and-drive and while it’s nice, the 311hp V-6 felt like it was more suited to the car. 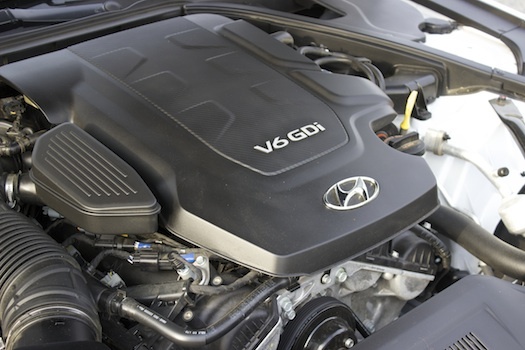 It gives you more power than any of the six-powered cars it naturally competes with (Lexus GS, Mercedes-Benz E-Class, BMW 5-Series), without feeling like it’s trying to be a performance car. The engine mates to an eight-speed automatic transmission and the best thing you can say about it is that you barely notice it’s there. It’s what the promise of a CVT should have been, and never was: Imperceptible shifts, and the perfect gear exactly when you need it. A few issues: After driving the car a few days, the power trunk lid stopped working from the three possible locations offered to open it. Secondly — and we’ve noticed this in more than one Hyundai — the Bluetooth streaming is erratic, at least from an iPhone. It skips incessantly while either streaming from the Stitcher podcast app, or the music on my phone. That’s never been an issue with any of the other cars I’ve driven. You can hardwire the phone through the USB port, but by this point, Bluetooth streaming should be pretty well put together. All-wheel drive — which again, is this car’s entire reason to exist — pushes the price tag up $2,500 to $41,500. Ok, pricey, but we’re still cool. The option packages, though — all of which depend on each other, with the exception of the 3.8 Signature Package — are breathtakingly expensive. Simply adding the panoramic sunroof, which makes the passenger cabin feel so open and airy, will set you back $4,000, because the only way to get it is to buy the 3.8 Signature Package. That also includes the Lexicon 14-speaker audio system and a whole lot of additional equipment, including the Blind Spot Monitoring system, sunshades, tilt and telescopic wheel and HID headlamps. Interested in three additional speakers, premium nav and that gorgeous matte wood finish? That’s going to cost $3,500 for the 3.8 Ultimate Package, which also includes the power trunk lid and smart high beams. 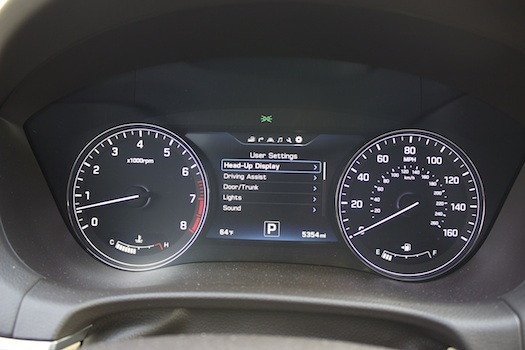 But you’re not done yet, because that package requires the purchase of the 3.8 Tech Package, which includes those nice Ultra Premium Seats and the 7-inch TFT display. That adds another $3,500. 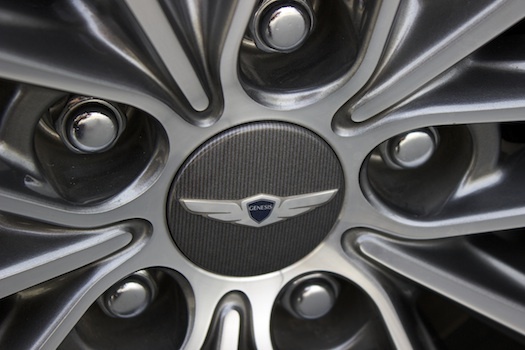 All told, our 2015 Hyundai Genesis 3.8 AWD rang up to $52,450, including the destination charge. Every single person we mentioned that price to said “$52,000? For a Hyundai?” And that’s the major challenge that Hyundai has to face to put this car in the hands of people who buy luxury cars. You can see just how hard Hyundai has struggled with moving the Equus, which is a nice car, but which people are unwilling to part with $61,000 for. It’s bled into this car, which should really be considered the very top of the Hyundai line, but isn’t because the Equus is there. It’s not fair that the name Hyundai still equates with the $4,995 Excel it sold here in 1985. It’s also not fair that Chevrolet still has to explain to potential customers that it stopped building Vegas in 1975. 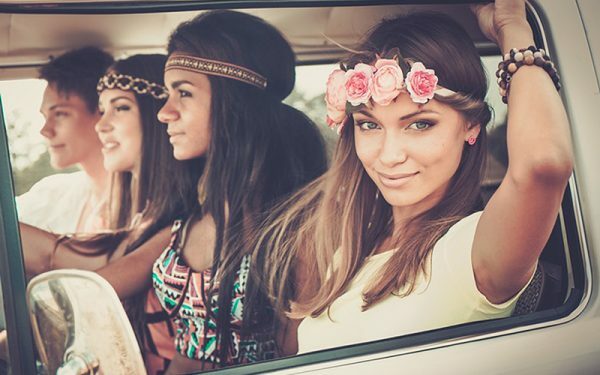 American consumers have a ridiculously long memory for that one time their aunt spent all her money on a car and it left her stranded beside the road. 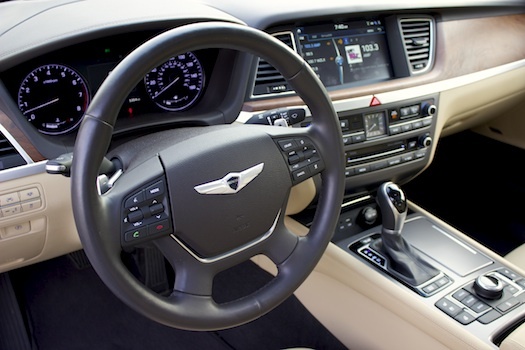 Leave all that aside, and the 2015 Hyundai Genesis is either competitive, or better than, every car it competes with in its class, at a lower price even when you equip it to the hilt. 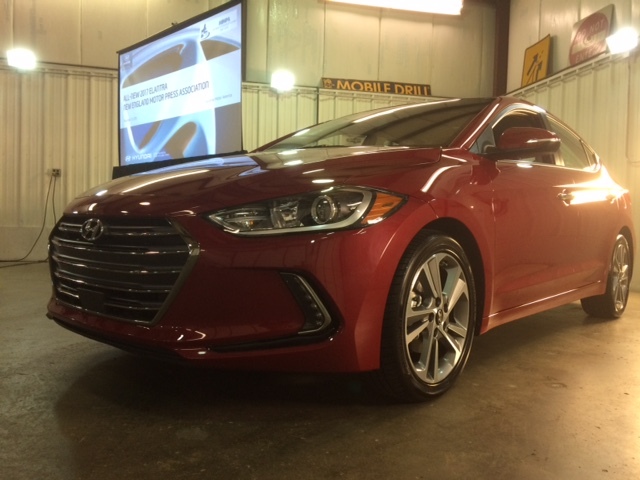 Let’s see whether Hyundai can get Americans to acquiesce to spending that much money.